And that's another long Easter weekend break done and dusted. I can't complaint much as despite the odd flurries of snow here and there, on a whole it was dry and sunny. The dreaded rain that dampened every Bank holiday was no where to be seen....Hurrah! On Easter Sunday, I made this oriental-inspired roast. The leg of lamb, a must for Easter, was first rubbed with fragrant five-spice and studded with garlic slices before roasting on the bone for maximum flavours. This unusual roast combination was inspired by a pop up from the Experimental Tim Anderson (as he was introduced on this year's Masterchef), which I attended right about exactly a year ago. I loved the dish so much that I attempted my very own creation that following week. Without any actual recipe, I had to make things up as I went along. I was rather chuffed with the end results, so much so that this year, I have decided to re-create this dish again, with a few minor tweaks. I have always been a fan of making modern Yorkies. As much as I love the traditional plain Yorkshire pudding, sometimes I do think introducing some unusual flavours into them makes them that much more enjoyable. I have, over the years, added herbs like my thyme and cayenne yorkies and spices such as cumin and poppy seeds. Bizarrely, it has never crosses my mind to use Szechuan peppercorns. And I must say that was a revelation. These aromatic yorkies are a joy to eat and soaks up the sweet Shoaxing rice wine and oyster sauce gravy beautifully. Learning from my last attempt, I used more peppercorns this time round and only crushed them slightly rather than ground them which I think gave a much better overall flavours. As for the Chilli roast spuds, the cayenne pepper provided lovely hints of spicy kick and also coat them with a beautiful red glow. 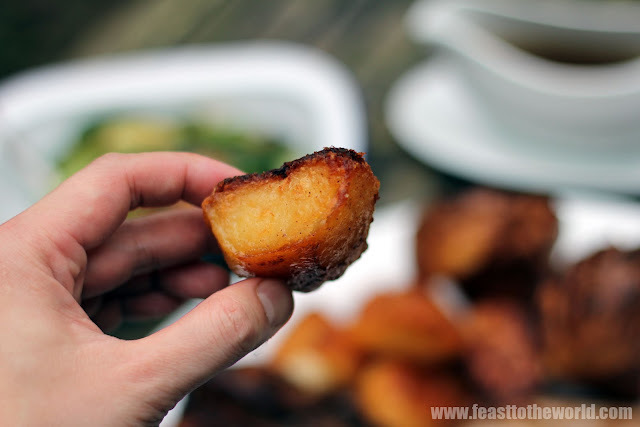 Like most of my roast potatoes, I like to use a mixture of goose or duck fat and sunflower oil as I find this combintation produces the best crispy spuds. And that's my Easter Sunday Roast.......Perfect! The day before. Mix the five spice powder with olive oil and rub the lamb thoroughly with this mixture. Using a small sharp knife, makes incisions all over the thicker parts of lamb and insert slivers of sliced garlic into this cuts. Do not worry if they are not completely hidden. Wrap with cling film and keep in the refrigerator overnight. When ready to cook, take the lamb out of the refrigerator and allows to return to room temperature. Preheat the oven to 220ºC. 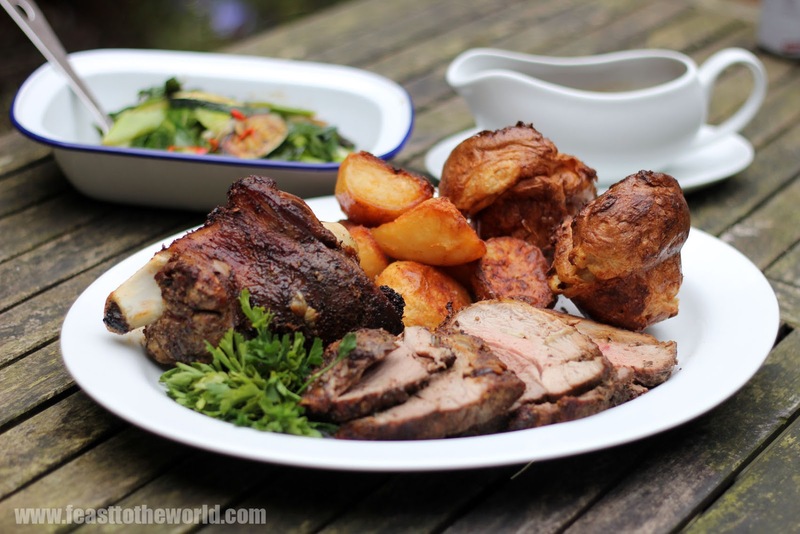 Place the lamb leg in a roasting tin and cook for 20 minutes. Turn the oven down to 180ºC and cook for another 30 minutes for medium rare. Add an additional 10 minutes for medium and if you want it well done, forget it and cook something else as I personally think lamb should always be serve pink. 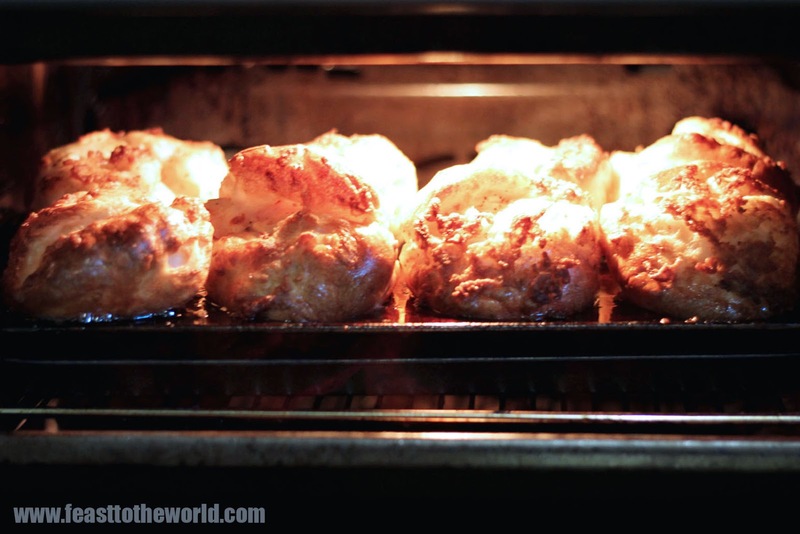 While the lamb is roasting, make the Yorkshire pudding batter. Sift the flour into a large bowl. Add the eggs and egg white and slowly whisk in the milk. Add the crushed Szechuan peppercorns and season with salt and pepper. Whisk until smooth. This can now be set aside to rest for at least 30 minutes. Longer if you've got the time as this will produce a much lighter batter. Re-whisk the batter just before cooking until you get a smooth consistency. Once done to your liking, remove the lamb from the oven and cover the lamb with some baking foil and rest in the roasting tin for 45 minutes to 1 hour. Turn the oven back up to 200°C. Meanwhile, bring a large pan of salted water to a gentle boil and simmer the potatoes for 5 minutes. Drain in a colander and shake to break down the edges of the potatoes slightly. This roughen surface is going to give you the most crispy and crunchy roast spuds ever. Leave this to cool for 2-3 minutes. In a hob-safe roasting tin, heat up the goose or duck fat with sunflower oil over medium heat until smoking. Add the potatoes to the smoking oil and carefully with an oven gloves, shake gently to coat the potatoes thoroughly with the hot oil. Sprinkle the cayenne pepper and season with sea salt and freshly ground black pepper. Roast in the oven for 30 minutes. After this time. Turn the potatoes in the pan and move the roasting tin to the lowest shelf in the oven. Turn the oven up to 220ºC. Fill the individual Yorkshire or muffin pudding tin with a tablespoon of oil. Place in the top shelf of the oven to heat for 5 minutes, until almost smoking. Pour the smooth batter carefully and evenly into the holes until almost full. Immediately place the tin back into the oven and bake for 25-30 minutes, until the puddings have puffed up and crispen and the potatoes are nicely golden brown and crispy. While the Yorkshire pudding and the potatoes are in their last stage of roasting, Remove the resting lamb leg from the tin and place on a carving board. Pour away any excess fat but keep most of the remaining cooking residue in the tin. Place on the hob and heat over medium heat, add a tablespoon of flour and cook for 1 minute, stirring with a spatula to make sure that it gets nice and brown and soaks up all the fat and juices. Add the Shaoxing wine, then stir vigorously to deglaze the tin and loosen any residue. Add the chicken stock or water and oyster sauce. Turn up the heat and bring to a rapid boil. Simmer for 5-10 minutes to reduce the gravy by a third. Season to taste and satrain through a sieve into a gravy boat. Carve the lamb into desired thick slices and serve with the Yorkshire puddings, crispy roasted potatoes and the aromatic gravy along with your choice of greens.